ruthdelacruz | Travel and Lifestyle Blog : Medical Practitioners: How Can You Be Fashionable with Scrub Suits? Medical Practitioners: How Can You Be Fashionable with Scrub Suits? I have never imagine myself wearing a pristine white uniform just like what the nurses used to wear with that nurse cap. Maybe that's the reason I said a firm NO when my sister suggested I took up nursing in College. If not mixing drinks and working as bartender in a local bar, I imagined myself working in a corporate world, probably wearing stylish clothes and attending events and rubbing elbows with the popular and famous. Until nursing uniforms have evolved, and we no longer see nurses in that white skirt and blouse, but mostly in scrubs suits in different prints. 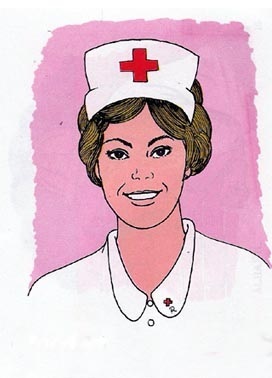 Our company nurse always wear that plain pink scrub suit that fits her cheerful personality. Now, I wonder if ever I become a nurse, would I ever wear anything with Jordi Labanda prints, or Marilyn Monroe? or wear fashionable style like scrubs flare pants? For all the fashionable (and not-so-fashionable) medical practitioners, check out http://www.blueskyscrubs.com/ for variety of scrub choices. What are the fun prints of scrub suits have you seen lately? © ruthdelacruz | Travel and Lifestyle Blog : Medical Practitioners: How Can You Be Fashionable with Scrub Suits?